Bodega raises $2.5M to build a smart store kiosk in your apartment buildingIf you're in a big city like New York City, you're probably used to walking around the block away from where you live to the corner shop and picking up a jug of milk or some dishwashing detergent. Two Ex-Googlers Want To Make Bodegas And Mom-And-Pop Corner Stores ObsoleteWhile it sometimes feels like we do all of our shopping on the internet, government data shows that actually less that 10% of all retail transactions happen online. In a world where we get our groceries delivered in just two hours through Instacart or Amazon Fresh, the humble corner store-or bodega, as they are known in New York and Los Angeles-still performs a valuable function. Would you recommend Bodega to a friend? The concept itself isn't new – it's essentially a modern day vending machine – but Bodega is getting a ton of heat this morning, largely because of the name itself. From the FastCo article: "...replacing that beloved institution seems explicit in the very name of McDonald’s venture, a Spanish term synonymous with the tiny stores that dot urban landscapes and are commonly run by people originally from Latin America or Asia. Some might bristle at the idea of a Silicon Valley executive appropriating the term “bodega” for a project that could well put lots of immigrants out of work." I see it as a they are freeing a lot of people from the onerous task of running a store! So like, how many POC do you have to hate being around for you to basically make a glorified vending machine? 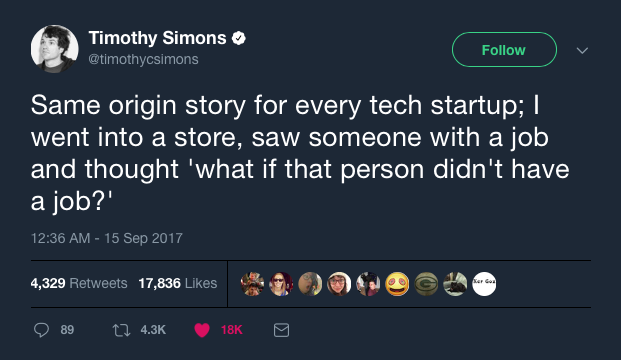 I like tech as much as the next person, but if your main business concern is helping wealthy white people fence themselves off from the people whose neighborhood they're gentrifying, then I seriously question the moral motivations of the tech industry and its aspirations for making our lives better and easier. @glvninpdx apparently it didn't go over so well on Twitter. The people in their ads have never even seen a bodega except on the evening news. They aren't putting anyone out of business.